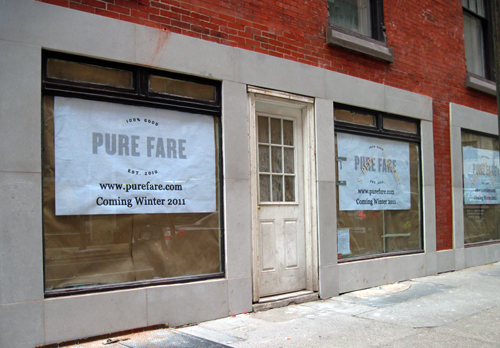 Pure Fare is a first of its kind fast casual concept. Pure Fare’s mission is to provide fresh, healthy, all natural foods along with an integrated suite of interactive web based tools that allow consumers to understand the vital relationship between food and health. We strive to be 100% transparent – no gimmicks. Simply put, we want to bring to life the famous mantra: “You are what you eat.” Whenever possible, we strive to source the finest organic ingredients available. This principle not only allows us to cultivate lasting and meaningful partnerships with local farmers and artisans, but it also ensures that our food always represents the highest standards in quality, taste, and nutrition. This emphasis on quality permeates the Pure Fare brand -we proudly champion sustainable practices in all aspects of our business from composting to filtering our own bottled water to using environmentally friendly packaging.